This is the fourth installment of my column on training that appeared in September 1999 issue of TaeKwonDo Times. In previous articles in this column (in TaeKwonDo Times March 1999, May 1999, and July 1999) you learned how to determine if you have the potential to do a side split and a front split, even before you start your stretching program. In this article you will learn about kinds of flexibility and the right role for splits in kicker's training. DynamicThe ability to perform dynamic movements within a full range of motion in the joints. 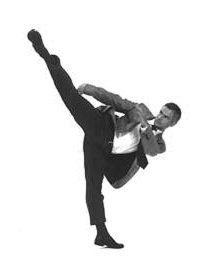 High kicks are a display of dynamic flexibility. Static passiveThe ability to assume and maintain extended positions using your weight (splits), or using strength not coming from the stretched limbs, such as lifting and holding a leg with your arm or by other external means. Static activeThe ability to assume and maintain extended positions using only the tension of the agonists and synergists while the antagonists are being stretched. One example is lifting the leg and keeping it high without any support. The principles of flexibility training are the same in all sports. Only the required level of a given kind of flexibility varies from sport to sport. Flexibility training is speed-specific because in the muscle there are two kinds of stretch receptors, one detecting the magnitude and speed of stretching, the other detecting magnitude only. Dynamic stretches improve dynamic flexibility and static stretches improve mostly static flexibility, which is why it does not make sense to use static stretches as a warm-up for dynamic action. Flexibility training is also joint-specific. One person may have great flexibility in some joints but not in others, some joints may have great range of motion in one plane of motion but not in all planes. Finally, flexibility training is position-specific. If you stretch lying down but display your flexibility standing up, your range of motion is going to be worse than if you stretched standing up (Breit 1977). Dynamic stretching by using movements similar to the taskfor example, leg raises before kicking, lunges before fencing, arm and racquet swings before playing tennis, done with gradually increasing range and speed of motionfacilitates neural pathways that will be used in the task. (Facilitates means increases the excitability or receptivity of the neurons involved in the movements because of repetitive use or because of the accumulation of impulses arriving from other neurons.) These movements of gradually increasing similarity in range and speed of motion require muscular contractions increasingly similar to those of the task (e.g., kick, fencing attack, serve). These contractions cause arterioles and capillaries in the working muscles to dilate in proportion to the force of contraction. Static stretches do not facilitate these neural pathways, do not prepare the nervous system and blood vessels in the muscles for the dynamic task. You even sweat differently when warming up with dynamic actions than when doing static stretches. During dynamic exercises you sweat all over and your sweat is hot. During static stretching you sweat little, mainly on the face. This tells you that static stretching, such as attempting splits, is a poor warm-up. That takes care of the common misconception that sitting or standing in stretched positions, and attempting to do splits during a warm-up, improves one's range of motion for kicking. (In a future column I might address the misconception that static stretching before a workout prevents injuries.) Static stretches are most effective at the end of your workout, during cool-down (Stretching Scientifically, p. 13). As a kicker, then, why should you be interested in doing a front splita static stretch nonspecific for kicking that requires static flexibility while kicks require dynamic flexibility? Because being able to do the front split facilitates (though it is not necessary for) learning high side and roundhouse kicksthe position of legs in a front split is the same as in high side and roundhouse kicks (the rear leg in this split corresponds to the kicking leg and the front leg to the supporting leg). If you can do the front split, you can practice the high side and high roundhouse kicks slowly enough to control and correct your body alignment, especially of the supporting leg in relation to the kicking leg and of the trunk in relation to the legs. The side split, if done according to my method of developing flexibility and strength both at the same time, strengthens muscles of the inner thigh. These are the muscles of the supporting leg that are stressed when you do high kicks. During a kick the kicking leg displays only dynamic flexibility but the stretch on the supporting leg is more like a static stretch, albeit short. The inner thigh of the supporting leg tenses while being stretched by the momentum of your whole body moving toward a target. To strengthen the muscles of the inner thigh you can either tense them in a wide straddle stance and eventually in a side split or you can do resistance exercises such as adductor flyes and adductor pulldowns (shown on the video Secrets of Stretching). In the next column you will learn about the method of developing dynamic flexibility so you can kick high anytime without any warm-up. Kurtz, T. 1990. Secrets of Stretching: Exercises for the Lower Body. Island Pond, VT: Stadion Publishing Co. Inc.